Good news, everyone. 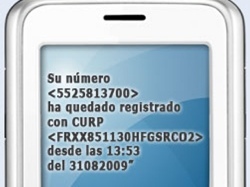 That Mexican law that requires cellphone users to be fingerprinted and registered into a national database went into effect [Spanish] the other day. It’s an effort to crack down on violent crime, since, as well all know, cellphones are notorious criminals and won’t think twice about dropping an Acme anvil onto your head. I won’t even pretend to understand the ins and outs of the current Mexican situation, something to do with Americans’ insatiable appetite for the likes of marijuana and cocaine, and Mexican drug lords’ uncanny ability to supply those drugs at whatever the cost. It’s pretty bleak, yes. Right, so moving forward, anyone who wants a cellphone in Mexico will have to provide official photo ID, an address and step up to the fingerprinting booth. If you already have a cellphone you’ll have to retroactively provide all that information. Here’s a fun stat: there’s 70 million cellphones users in Mexico, and some 90 percent of them use a pre-paid phone.